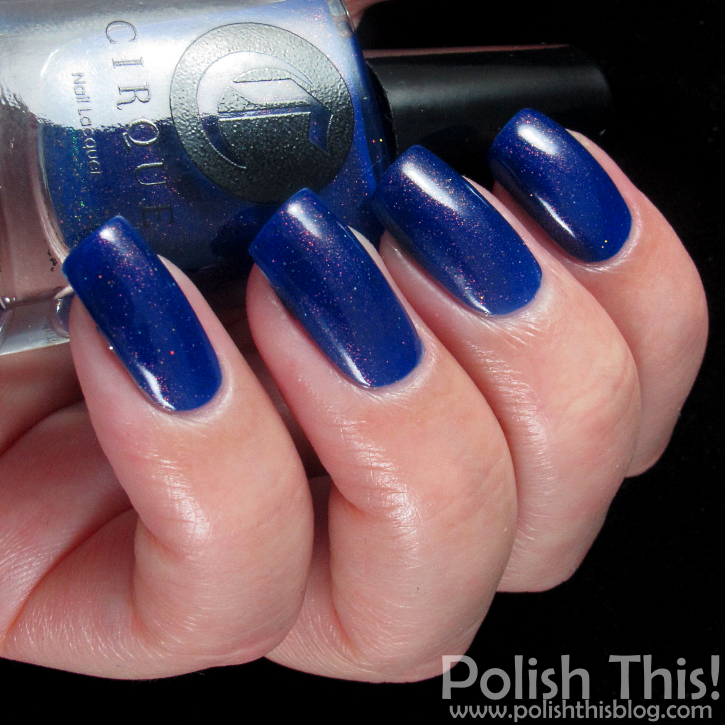 Cirque Kontiki Collection Swatches and Review - Polish This! 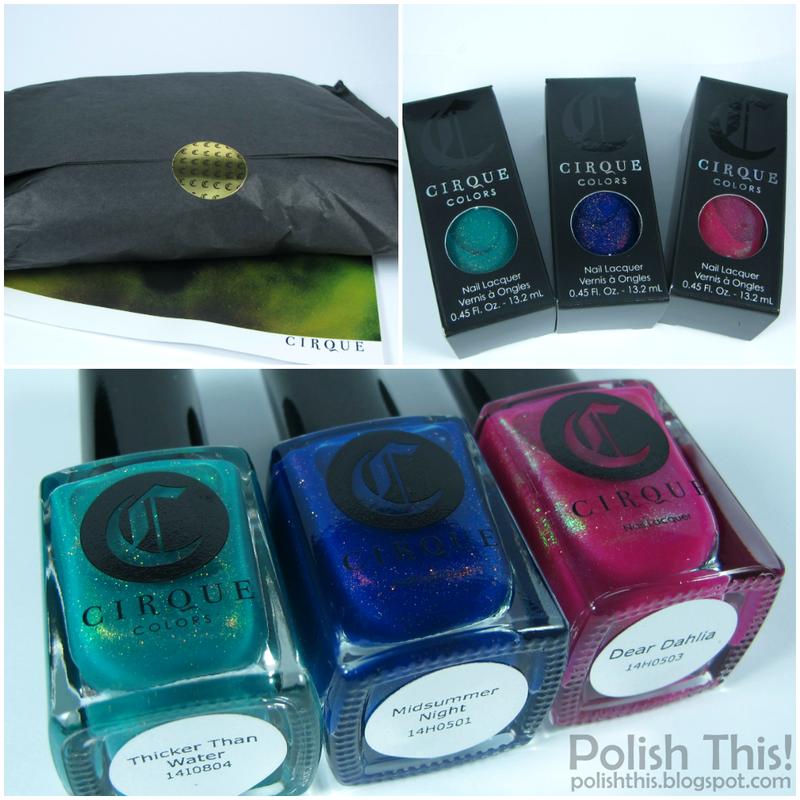 I have Cirque Kontiki collection swatches and review to share with you guys today! I know I'm a bit late with these, but I thought I should share my swatches now that at least some of these polishes are still available. Keep in mind that this is limited edition collection, so if you want any of these, you should really act fast. I ended up buying this whole collection myself which is quite rare as I don't usually buy whole collections. Somehow these all just looked like they were made for me and since it was a collection with only three polishes I thought I could pamper myself a little and buy them all. And believe me I'm so happy that I did since these looked sooooooo stunning in the bottles when they arrived and they are just as gorgeous on nail too! By the way, I already used all of these for my Cirque Kontiki nail art manicure, but let's see those swatches now. Dear Dahlia is a hot fuchsia jelly with color-shifting shimmer. The shimmer looks more green in shade and more golden in sunlight. This was a bit sheer, I have three coats here, but because of the fact that these are jellys, there's still some nail line visible here. I didn't really mind that since this polish is such a gorgeous one and I love how that jelly formula gives this such a juicy look and also some beautiful depth to the polish. If you want these to cover completely, you could use some similar colored creme under them. This is totally unique pink to me, I love it! Hello gorgeous! - this is Midsummer Night, a stunning cobalt blue jelly with color-shifting shimmer that looks most of the time red, but it shifts to gold/green also. This is seriously one of the most gorgeous blue polishes that I've ever seen! Once again the jelly formula gives this gorgeous depth and the shimmer makes this look like the polish shines from within. I have three coats here also, this was a bit patchy with the first coat but it leveled out nicely with the second and third coats. Oh my, these just keep getting better and better! This is Thicker Than Water and the color is to die for! It's a stunning green turquoise jelly with color-shifting shimmer. In this the shimmer looks mostly golden and green. If Midsummer Night was one of the most gorgeous blue polishes I have ever seen, then this has to be one of the most stunning green/turquoise, it's just so beautiful! Once again I used three coats here, though this seems to be the most opaque out of these three, so you might get by only with two coats. Yup, I was totally right, this collection was certainly worth of buying and it truly looks like all of these three were made for me. I love them all! I bought these from www.cirquecolors.com but these also seemed to be still available via some of the stockists. How about you, do you like this Kontiki collection and which one is your favorite? Beautiful swatches, especially with Thicker Than Water -- your photos of it are the best I've seen anywhere! My favorite of these three is Midsummer Night, I'm a sucker for the blue/red contrast. Komialta näyttää koko kokoelma! Thicker Than Water puhuttelee myös mua eniten, sen voisin vaikka hommatakin jos vain mahdollisuus koittaa. Pretty swatches!!! I am eyeing on that green one. I super like the color. Though its not my typical nail color but I am so excited to try it out. These are totally worth it! The shimmer is amazing. I've loved this whole collection a lot. I'm in love with jellies and the shimmer in these is just an attack to my will. How could I resist? ?